In what was a promotion seemingly plagued by one snafu after another, Julio Cesar Chavez Jr.'s initial WBC middleweight title defense versus Ronald Hearns in Culiacan, Mexico on September 17th has been postponed. The story is that Chavez injured his right hand as he caught it on a ceiling fan while stretching out a few weeks ago. "It seems a little bit preposterous to me," said Hearns' promoter, Lou DiBella, who wasn't buying it. "I have to say that the picture was sort of fuzzy, like it could've been anything and it sort of looked like a guy who nicked himself shaving and then hearing that he was training with [Antonio] Margarito a day or two ago and the weirdness of the release of his weight on the 30-day weigh-in and the fact it took a long time for the weight to come out and then all the rumors out of Mexico that he was very, very heavy- it's sort of hard to believe. "So to be honest, I'm not buying it. Particularly since minor injuries seem to be a habit with young Mr. Chavez." As this fight was announced, there was an internal tug-of-war between Top Rank and Zanfer Promotions, which co-promote the son of the legendary “JC Superstar.” While Bob Arum made it clear from the onset that he wasn't for this tune-up fight, especially in light of having an HBO date for November 19th in his back pocket, Fernando Beltran seemed to have other ideas. Throughout this whole ordeal, never once did it seem like that the two promotional companies or Chavez's management, led by Billy Keane, were ever on the same page. The road to Culiacan was really the road to perdition. "It's hard to say," said Alex Ariza, Chavez’s strength and conditioning coach, on Friday afternoon at the Wild Card Boxing Club. "I mean, I don't know much about the promotional side. All I know is that my guy always gets the short end of the stick when it comes to getting the time to train and prepare for a fight. Here we are getting five weeks to prepare for this first title defense and the whole time, you get one side saying, 'Yes, there is a fight,' and the other side saying, 'Absolutely not; there is none,' and I mean, I dunno. It just seems like one of those consistent things with Zanfer Promotions, they don't know what one hand is doing from the other." DiBella stated, "Honestly, this was easy to see coming but Ronald Hearns really got victimized. He was training. He looked at this as the opportunity of a lifetime and he went to Mexico for the press conference and then he finds out that this happens and I don't think he's really buying it either." Of course, some believe that Hearns- who just recently got stopped by Felix Sturm in an attempt for the WBA middleweight title- didn't even deserve this shot but the bottom line is, he got the fight, signed his name on the dotted line and was willing and able to fulfill his commitment. Too many times in the past, Chavez has been allowed to skirt such responsibilities. After all, he's the son of Chavez, the straw that stirs the drink, boxing's version of a trust fund baby, where rules don't necessarily apply. While he will always retain a sizable fan base, there is growing skepticism of his reliability and professionalism. "It's hard to say. This is the thing; Julio will fight up to the level of his competition," explained Keane to Maxboxing. "So he from the start did not really respect Ronald Hearns. He didn't think he was in the same league as him and did not train as hard, as for instance when he fought Sebastian Zbik, who we thought was going to be a very competitive, hard fight. So I mean, the key for Julio is to keep him motivated and keep him in competitive fights." Perhaps all those years of coddling from his handlers and the adroit matchmaking of Top Rank have given Chavez Jr. a false sense of security. It's not like he was brought up in a way that Marvin Hagler would be familiar with and more than once, as he came in over the contracted weights, things were done to take care of the situation. That's what happens when you're a cash cow- you get enabled over and over again. 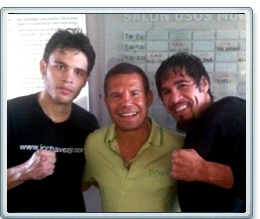 If Chavez had any real intention of fighting on this date, why was he not at the Wild Card Boxing Club last month? Even boxers who go through the motions have to train, right? Keane says, "A lot of people think his unwillingness to come to L.A. shows some kind of laziness or lack of commitment. The reality is, Julio doesn't simply like to be away from home. He's a homebody. He doesn't like to travel. He likes to be with his girlfriend at home. It's his comfort zone. So it's not that he's really a prima donna or unwilling to travel. It's just really that he's comfortable at home." It must be noted that plenty of fighters come to train with Roach from far away locales, such as WBA welterweight titlist Vyacheslav Senchenko, who spent the better part of the summer in Southern California to train at the Wild Card, away from his homeland of Ukraine. Keane insists that the reports of Chavez looking like a bloated torta are greatly exaggerated. "He was low 170's. The weight was fine," he said. "All this nonsense from Lou that he faked an injury, that he was 185, is just ridiculous." Ariza, who was scheduled to go to Mexico to meet Chavez this weekend, added, "He wasn't in bad condition. I know people are making it out to seem that he was. When I got there, he was roughly around 180 pounds. By week’s end, he was already down to 173. Like everybody knows, those first ten pounds are going to come off easy but with four weeks, it's very, very doable. It wasn't something that was impossible, that we were going to kill ourselves or any of those things." Arum gets what he wanted all along. "Well, from the get-go, I said I didn't want anything to do with it," he said. "We have Freddie in the Ukraine and then he's coming back, where he's going to be on this [press tour] with us and I'm going on the tour and then we gotta get ready for the Cotto-Margarito tour and I got this event at Notre Dame (September 16th). I didn't have time for an event on September 17th. So the kid said he wanted to do it anyway. So Fernando Beltran said he would facilitate it and the government was supposed to put up the money. I wasn't around because I had other commitments. Alex Ariza wasn't around because he had other commitments and he couldn't spend the time in Mexico. "So y' know, it was the kid being stubborn and then the kid got hurt apparently. I didn't know anything about it and still he wanted to push through and finally didn't. So my recommendation to him is that when Freddie goes to the Philippines, [Chavez] goes over with Freddie with his sparring partners and gets ready for November 19th." Getting this guy to go over to “Pacland”? Yeah, good luck with that.